“Wespe” (German “Wasp”) is a light German self-propelled artillery mount (SPG) class of self-propelled howitzers on the chassis of the light tank Pz Kpfw II Ausf F. “Wespe” was armed with a 105 mm howitzer leFH18. 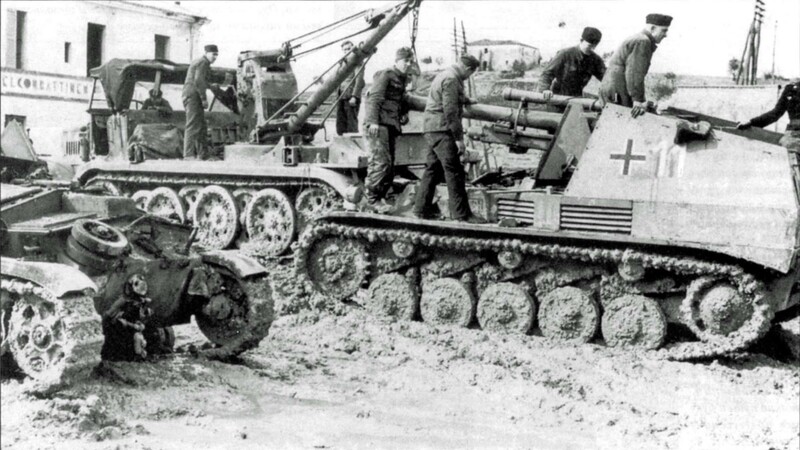 In the background, a mobile crane on the chassis of the German semi-tracked tractor Sd.Kfz. “Famo”. On the left is the Italian Semovente 75/34 self-propelled gun.